oz.Typewriter: Typewriter is in Minnesota; How Come it's For Sale in Australia? 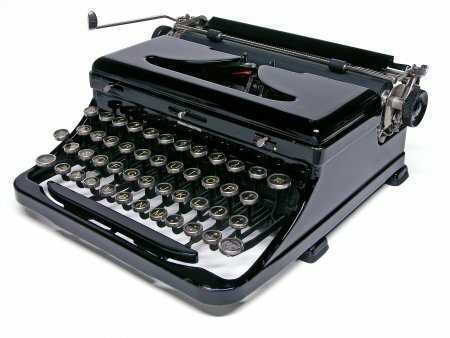 Typewriter is in Minnesota; How Come it's For Sale in Australia? The typewriter listed as being for sale on eBay in Australia. Note, this typewriter does NOT have a decal under "Touch Control" saying "Built in the British Empire". Nor does it have a Royal decal on the paperplate. Our beloved new ETCetera editor Alan Seaver has yet again had one of his typewriters listed as being for sale in Victoria, Australia. Poor Alan must be wondering what the hell is going on! What's going on is fraudulent, highly illegal behaviour by Australian eBay sellers. And they get away with it! What is it with Victorians who list typewriters for sale on eBay? Do they think they are law unto themselves? This latest example popped up on Australian eBay this morning. It's listed as a "rare 1936 Royal Touch Control Typewriter" with a starting price of $99. It has already received one bid. That early bidder thinks he or she has committed good money to a typewriter that is in country Victoria. The lead image is of a typewriter which is actually in Minnesota. The listed postage cost of $28 will hardly get it from Minnesota to Australia. But it gets worse. 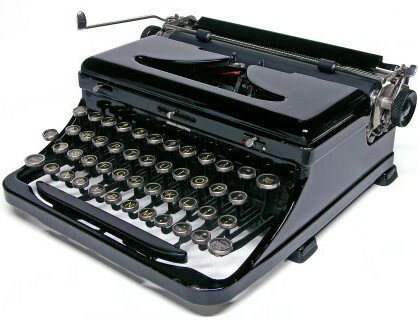 Not only has the seller - hard2find03 - used a photograph of Alan's typewriter as the lead image, but he or she has used Alan's EXACT words in the listing description. By using the nominative singular pronoun "I", the seller is claiming these words as his or her own. They are Alan's words, describing his own typewriter, not the one for sale in Victoria. The listing is here. Alan's typewriter is here. Alan's words: "This model is frequently referred to as 'Touch Control' because that is the only labeling to be found aside from the Royal logo (the decals, alas, are almost completely worn off of mine). Many collectors refer to it as the Model O because the serial number carries an 'O' prefix. Officially, Royal called this the Portable Standard. It's unclear exactly when this body style was introduced; the earliest example I have seen dates to 1934. Later versions have a raised, wear-resistant logo on the paper rest. The Standard/Touch Control/Model O is one of the most frequently found pre-war portables, and its commonality causes many collectors pass it over. Yet this is classic 1930s design, and a terrific typer for actual use." The seller's words: "This model is frequently referred to as 'Touch Control' because that is the only labeling to be found aside from the Royal logo . Many collectors refer to it as the Model O because the serial number carries an 'O' prefix. Officially, Royal called this the Portable Standard. It's unclear exactly when this body style was introduced; the earliest example I have seen dates to 1934. Later versions have a raised, wear-resistant logo on the paper rest. The Standard/Touch Control/Model O is one of the most frequently found pre-war portables, and its commonality causes many collectors pass it over. Yet this is classic 1930s design, and a terrific typer for actual use." 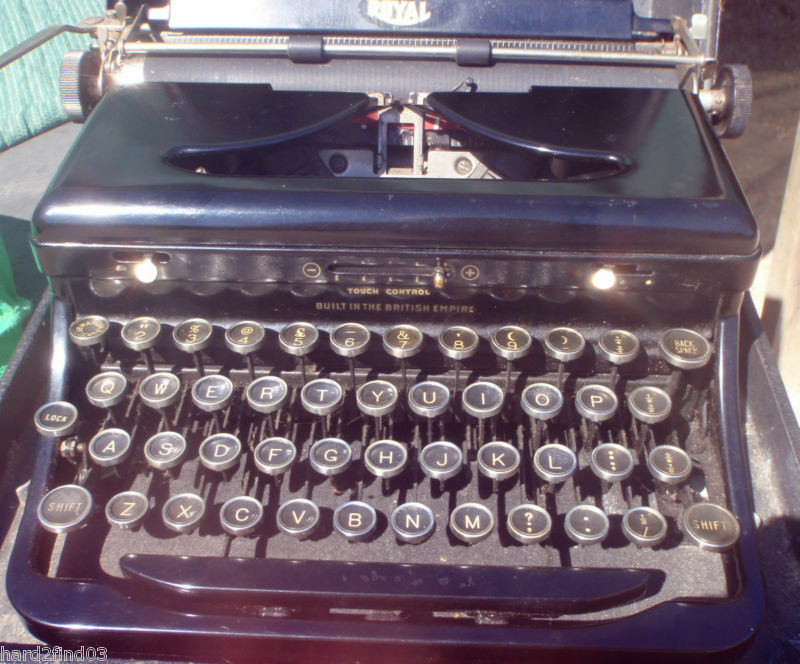 OK, there are secondary images of the actual typewriter for sale. But bear in the mind that the image which comes up on searches is Alan's. This seller has had 2530 feedbacks for a perfect, 100 per cent record. It's amazing how they get away with this sort of thing. One reason is that when a prospective buyer tries to query anything about the listing, they get an eBay-generated response, "We're sorry we couldn't find an answer for you. Unfortunately, this seller is not able to respond to your question. We suggest reviewing the item again to see if your answer is in the seller's listing." LITTLE WONDER! eBay is complicit in this deceit. It must be held accountable for it, somehow. The only way is for eBay to track down the cheaters and bar them from selling. Some of Georg's typewriter have "turned up" on the local auction site as well - but what can one do? Basically nothing. I doubt that an "intellectual property infringement record" will make them stop the auction or anything. Sadly, you're probably right, Florian. When it happened to me, eBay refused to accept a listed typewriter was "unique", or that I knew the actual owner. It's unfortunate that the best case scenario here will be the unlucky buyer leaves negative feedback after receiving a typewriter "not as described". Or simply gets a refund, in which case the seller gets away with it. Images that are nice and clear, such as Alan's, are likely to be stolen. I would suggest Alan and others to water-mark their photos (as the seller did of his own) to prevent theft. That's happened to me at least once. Some months ago I detected an ad in the local eBay associate, MercadoLibre, where this guy was selling an IBM Selectric II... using a picture I took of my mint-green machine for my blog. "Nice photo", I said to the seller as a question to his ad. "Looks exactly like my own typewriter; I have the photo here...", with link to MY blog. Needless to say, the photo disappeared from the ad. Ebay does not care about anything but collecting its fees on listings selling and forcing people to use PayPal and collect more fees. AKA Corporate greed. I report my radio images all the time. Ebay's response: n o t h i n g.
Not quite the same type of fraud, but suspect descriptions, had me, last week, challenge two UK sellers. One had (it turns out) a couple of Good Companions for sale - one shiny and one not - and had got the pictures mixed up. The promised updated photos didn't materialse before the lot ended and the Imperial went for a very reasonable £29.50... question is, which one? The other lot plainly showed a Corona 4 yet was described as 'folding'. I contacted both sellers and politely challenged their descriptions and got prompt replies of acknowledged mistakes. Nonetheless, the £150 starting price for the stubbornly non-pliant Corona 4 saw the machine remain unsold. Interesting that after my challenge, the listing title changed from "Antique Vintage Corona Folding Typewriter With Case" to "Antique Vintage Corona Typewriter With Folding Case". Subtle.